justthefood.com...the blog: Worknight Wednesdays: A Fridge Full of Leftovers and a Giveaway! Worknight Wednesdays: A Fridge Full of Leftovers and a Giveaway! It's a Worknight Wednesday, and normally I'd make a meal that was big enough to double as lunch for the rest of the week. The trouble is, I still have a bunch of food leftover in the fridge, I had to work late tonight, and didn't end up making anything at all! So instead of sticking with my normal theme for Wednesdays, how 'bout I do a giveaway instead? Leave a comment (on the blog) letting me know your favorite easy weeknight meal and I will choose 2 winners at random. One will receive a copy of Hearty Vegan Meals for Monster Appetites, and the other will receive a copy of The Complete Guide to Vegan Food Substitutions. I will choose the winners on Saturday night at 5 pm PST. My favourite easy weekday meals are pretty unspectacular, I guess. I usually cook a ton of rice or quinoa and throw some microwaved frozen veggies in. Sauce optinal. But every once in a while I get something fresh to roast, like green asparagus or butternut squash (depending on the season). Yum! Nice blog, BTW. I still can't get over that pretty stromboli. My favourite quick meal is either pasta with tomato sauce and all the veggies I can find or a yummy sandwich with soup on the side. Definitely some sort of dal. I just throw some lentils and what not into a pot and then walk away and let it cook. Wow, I would love to win Hearty Vegan Meals for Monster Appetites (I already have the complete guide to vegan for sub's)! My favourite quick weeknight meal would have to be the Mac & Trees from Appetite For Reduction, I always have brown rice pasta & nooch in the house & I just change up the veg depending on what's in the fridge. Super easy pre-made brown rice from Trader Joes's with sauteed bok choy and homemade asian marinade :) Or, you know, peanut butter and jelly! Hearty Vegan! My favourite easy weeknight meal is a stir fry. Toss in some kale and carrots and broccoli and peppers and other veggies and some soba noodles and tofu and sauce it up. I have to admit, my favorite easy weeknight meal is a sandwich - tofurkey, cheese and coleslaw. I eat a lot of weeknight sandwiches--lots of vegetables, vegenaise, hot sauce, and tofurkey. Roasted Brussels sprouts and kale over quinoa. A little salt and pepper and you're good to go. Takes 20 minutes. Salad : ) A green, some sliced mushrooms, and whatever I have leftover in the fridge with maybe a dollop of hummus as "dressing". I try to just eat up whatever leftovers I have from the weekend or earlier in the week. Other than that, one if my favorite weeknight meals is a brown rice bowl with black beans or tofu and spinach. And a big squeeze of sriracha, of course. Warm oatmeal with a spoonful of peanut butter, cinnamon, and sliced bananas. I will never get sick of oatmeal! I will make an inventive salad out of any leftovers -- roasted veggies over assorted greens with balsamic drizzled over and a handful of some sort of cooked beans tossed in as well. Or - a can of fire roasted tomatoes, zucchini, onions, mushrooms, peppers (and other assorted veggies), chili flakes, numerous spices, white beans and simmer. Serve as is or over rice. Steel cut oats are another favorite! My favorite weeknight meal is a bean and rice burrito stuffed with tomatoes, onions, jalapenos, and guac. Sauteed greens, whatever kind I have on hand (kale, chard, collard, etc) with a cup of chickpeas thrown in and heated up in the last minute or 2..sprinkle with Mrs Dash (I like the tomato basil) and voila! Funny thing. 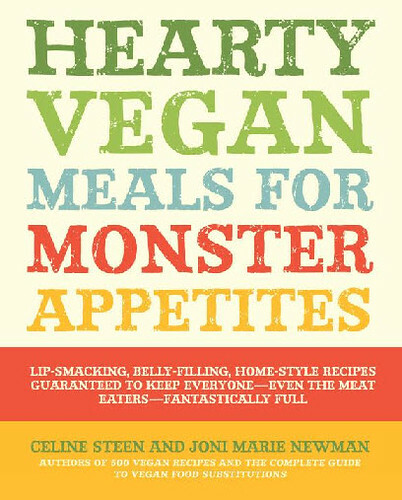 Just before I saw Healthy Slow Cooking's FB post about this giveaway, I was looking at what books are coming due for me at the library and I will have to return the copy of Hearty Vegan Meals for Monster Appetites that I've been drooling over in 9 days because there's a waiting list for it. I'd LOVE to have a copy of my very own. Anyway, my favorite weekday meal is fried rice as long as I have some good leftover veggies and rice to use up. Pasta with veggies or crockpot chili. If I'm low on time, I like to heat up some brown rice (which I always have on hand) and top with one of the vegan-friendly Kitchens of India or Tasty Bite Indian Packets. Nothing too special, but it's quick and easy and fills my belly! By the way, I recently purchased Hearty Vegan Meals for Monster Appetites and have made the Patty Melt and Smores Pie so far. YUM! My favorite, quick and easy weekday meal, would have to a snappy little taco. Fresh greens, some seitan (which I make once or twice per week), couple onions, and some cilantro to seal the deal! My easy go to weeknight dinner is a LOADED baked potato, with Earth Balance, Daiya Cheddar Shreds, Follow Your Heart Sour Cream, Bac'n Pieces, and green onions. Sinfully Delicious!! Or (almost all summer long) I make a green salad with EVERYTHING and a fresh ear of corn with Earth Balance!! Yummmmm!!!!! My husband's favorite is vegan nachos. I'm not sure which one we actually end up eating more often but I think it's the nachos. Oh man, I would love to have a copy of Hearty Vegan Meals! (I already own Vegan Subs). My lazy & quick weeknight meal usually consists of tofu fried up in some ginger, garlic, soy sauce and maple syrup, with a grain and something green. Or an Amy's frozen burrito, depends how much energy I have. I typically make a big batch of soup sunday or monday evening and have it throughout the week when I'm busy. Easy, quick, and delish. Tofu sandwiches and oven baked fresh cut sweet potato fries is my go to quick weeknight meal. My favorite weeknight meal would be chickpea or black bean tacos. It doesn't take long to saute beans with spices, onions, and garlic and put them in a tortilla with toppings. Plus, somehow tacos always feel like a treat. Tortilla chips with lettuce, beans, salsa and guacamole! My favorite weeknight meal of the moment is whole wheat spaghetti with tomato basil marinara (both from TJs), and a side of steamed vegetables. Easy to make and take! Spicy tofu with sprouts, lettuce, tomato and daiya cheddar shreds... open face on a huge slice of bread and some homemade vegan ice cream. Soup and stew are my main go-to-meals. Otherwise it's a bowl tossed together from leftovers. If I'm being honest, my super easy meal is pb&j. My slightly less lazy fallback meal might be tofu scramble or asian noodles with a bunch of vegetables, tofu, ginger, garlic, and stir fry sauce. I don't like a big meal in the evening, so usually a cup of tea and some cake or a nibble of whatever leftover is in the fridge & sometimes both. My favorite easy weeknight meal is a PB&J. It never gets old cuz I can change up the nut butter, the jam, or even the bread! So, for quick weeknights I put on a pot of brown rice to cook, toss some EF tofu cubes in spiced and seasoned cornstarch and fry until crispy while chopping the vege, then remove tofu from pan, use the same pan to saute the vege. All done byt he time the rice is, and often I've emptied the dishwasher and made the next days lunches at the same time too - have eto multitask! My favorite easy weeknight meal is to make a big pot of soup with potatoes and onions and cooked beans (and any other quick ingredients I have on hand) with dumplings. Thanks for offering such a great giveaway! I am one for tacos!! Tofu with agave nectar is my absolutely favourite and extremely simple. Then there is mac and cheeze which never gets old. My favorite go-to meal is chili. A can of kidney beans, can of black beans, can of tomatoes, 2 cans sliced olives, can of corn, some taco seasoning and 1/2 cup of water. Thanks for having a giveaway! We rely on a raw kale salad with avocado, shrooms, onions, and a homemade dressing. Then possible some oven sweet potato fries and GF vegan veggie burgers. Lately, my fave EZ meal is a quesadilla....tortilla, Daiya cheese and any other toppings I'm jonesing for. That and boring salad--but I never tire of it. A quick bean burger made with canned beans and some frozen fries - my kids love this and it is so easy and fast. I usually throw some dry udon into the pot and once it is done I saute some frozen chopped spinach with garlic and sesame oil, toss with the udon, and shove into my mouf. tasty. I've been wanting hearty vegans...for aaaages. I adore the complete guide to vegan subs. Current fave with the colder weather coming is savoury oats. So quick, easy and verstile. One of my fave combos is to just cook up some oats mix in some noosh and greens, top with salsa and black beans, maybe avo if I've got some hanging around. My favourite lazy weeknight meal is pasta stirred with marge and sun dried tomato paste. Its so damn good! I've heard of both of these books but have not had the chance to check them out and so I'm very curious. Thanks for the potential opportunity to do so! :) As unglamorous as it is, however, I think my favourite weeknight meal is pasta with nooch sauce. Just make a big ol' pot of each and keep munchin' for days, haha. cook for a while, and then make a slurry of chickpea flour (about 1/4 cup) and then mix into the rest and cook for a little while longer. ridiculously easy. I love a quick broccoli stir fry! Salad! For real--you can throw anything in/on a salad and it is quick and easy and sooooooo good. Lately I've liked using channa masala spice mix. I drain and rinse a can of chickpeas, throw it in a pot with some tomato paste, add water or chickpea liquid, and add as much spice as I can handle. In 5 minutes you have dinner! Quinoa, chickpeas and butter beans with Italian seasonings. Superfast and always filling. Thanks! First off, hi friends :-) Secondly, fantastic giveaway!!! So, for my fave quick weeknight meal, I take whatever protein is in my fridge (chickpeas, tofu, vegan "shrimp," a veggie burger, or whatever I have made recently) and roll it up into a burrito with Daiya cheese and Cholula hot sauce. I usually add some romaine lettuce or whatever else I can find in the fridge. I keep tortillas in my freezer, and then just defrost one when I need to make the mid-week burrito! That's a secret, guys! I love a quick stir fry on a week night! I usually have some vegetables cut up in my fridge, so it's super easy to throw together and so tasty! I made one of my faves tonight, brussels sprouts hash from Appetite for Reduction. I could make it in my sleep, and I almost always have the ingredients on hand. This is, of course, if I don't have soup leftovers in the fridge. 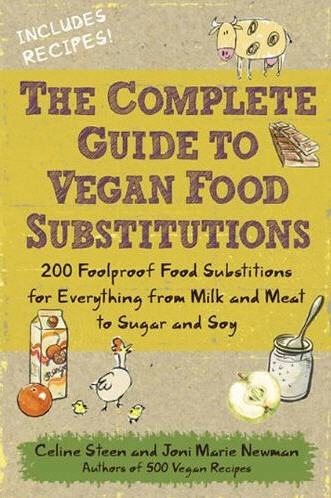 I already have the Vegan Sub book... Hearty Appetite is on my Christmas list, but I wouldn't mind getting it early! My boyfriend and I pretty much lived off of burritos and stir-fries when we were in college--easy and delicious! Whoa, mama, I love this giveaway! My idea of a fabulous & easy weeknight meal is my cashew miso alfredo pasta with kale! Steamed broccoli and brown rice with tahini sauce. I make rice in big batches and store it in the freezer, so I can have dinner ready in 5 minutes. Hmmm, not sure if I have a favorite weeknight meal. I try to make something new as often as I can. :) I do always love to make up a nice, creamy batch of risotto though. When I want something super quick, I just whip up some corn fritters and a salad, served with some vegan mayo and sweet chili or some other condiment...yummo. Pasta a a quick cashew sauce with whatever random veggies/tofu/tempeh are in the fridge!! The bf said to ask for the Hearty Vegan Meals!! My favourite easy weeknight meal would be a peanutty brown rice bowl - a layer of brown rice topped with baby spinach, steamed broccoli and some panfried tofu, topped with a simple peanut sauce. For a quick and easy meal, I like to put veggies in to roast. I don't have to mess with it once its in the oven too much, and I can then just toss with leftover brown rice or some pasta. My favorite weeknight meal is so easy, but yet so comforting. I make tofu steaks (tofu slabs sautéed with tamari, then sprinkled with nutritional yeast), mashed potatoes, quinoa on the side a few more veggies. stir-fried veggies with peanut sauce over some jasmine rice. Filling and easy but it tastes delicious. My favorite easy weeknight meal is to make a superfast curry. I chop up whatever veggies I have left in the fridge, saute them in a little oil, then add in a protein if I have one laying around (like seitan, chik'n strips, the gardein beefless tips) and heat until they are cooked through. In the meantime I whisk together one can of coconut milk, 1 TBS of soy sauce or tamari, some lime juice, a tsp of sugar, and a TBS or 2 of thai red curry paste (or green if that's your thing). Pour that over the veggies and cook for a few more minutes until it thickens a bit. Serve over rice, couscous, quinoa, whatever you have handy. two nights a week I teach until 9pm and have to make dinner when I get home. After years of struggling to think of quick dinners, now I have settled on a routine that those are always Giant Salad nights. I make a huge salad full of veggies and all sorts of good things... every once in a while we'll have toast or something with it... but mostly it's just salad night! My apparent go-to meal for nights I don't want to spend too much time exploring new recipes (which is most of the time!) are the Rosemary White Bean Burgers from What the Hell Does a Vegan Eat Anyways. WIth Sweet potato fries. Total comfort food. My family's favorite quick and easy weeknight meal is burritos. Cook some brown rice or quinoa, heat a can or two of black beans, steam up some whole wheat tortillas when they are almost finished than pop open a tray of trader joes guacamole along with tofutti sour cream and salsa for extra flavor. Yummy, healthy, quick, and easy.